SEATTLE (BRAIN) — Rad Power Bikes, a Seattle-based direct to consumer e-bike brand, says it will increase the price of its U.S. e-bike models by $200, and its commercial-grade e-trike model by $800. The price increases will take effect Aug.
WASHINGTON (BRAIN) — July retail sales were up 0.4 percent seasonally adjusted from June and increased 4.9 percent unadjusted year-over-year, according to an analysis of U.S. Census Bureau data by the National Retail Federation. The numbers exclude automobiles, gasoline stations and restaurants. Online sales up 11 percent year-over-year. One of the only categories to show a decline was sporting goods stores, which were down 5.7 percent. FORT COLLINS, Colo. (BRAIN) — Niner Bicycles is investing in enhanced operational capabilities to provide partially assembled bikes to its U.S. dealers. SAN JUAN CAPISTRANO, Calif. (BRAIN) — Interbike has announced the schedule for the 2018 edition of its Electric Theatre, which includes e-bike education sessions offered each day during the trade show. The Electric Theatre's presenting sponsor is Bosch. OCEAN, N.J. (BRAIN) — Frog Bikes has hired Bill Potter as its new Florida representative. 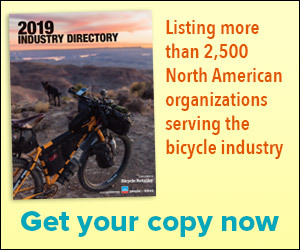 SAN CARLOS, Calif. (BRAIN) — Ritchey Design is expanding its agreements with Quality Bicycle Products and Bicycle Technologies International for the sale and fulfillment of Ritchey products. LITTLE ROCK, Ark. (BRAIN) — Allied Cycle Works, the domestic carbon fiber framemaker, has released a new "high margin" program for U.S. IBDs. Arkansas frame maker also hires Will Stoffel as IBD and export manager. BOULDER, Colo. (BRAIN) — Jennifer Harned, the president and general manager of Bell and Giro, and Justin Gottlieb, the vice president of Interbike, were recently elected to the PeopleForBikes Coalition board of directors.